Mobile phones with 3D displays finally reach the UK this month. In this article, we find out how they work and whether handsets such as the LG Optimus 3D and HTC Evo 3D will really be flying off the shelf. The UK’s first 3D mobile phones begin to hit the shelves this month. 3D phones such as the LG Optimus 3D and HTC EVO 3D promise to allow you to watch 3D videos on your handset, to play 3D games and to record videos in 3D. But does 3D really add an extra dimension to the mobile experience? Will they revolutionise the mobile industry or will it be another short-term fad? In this article, we find out how 3D mobile phones work and discuss the outlook for them. 1 How does the human eye perceive 3D? 2 How do 3D mobile phones generate a 3D image? 3 Are glasses required to use a 3D phone? 4 How well does it work in practice? 5 How much 3D content is out there? 6 How do 3D mobile phones capture pictures and video in 3D? 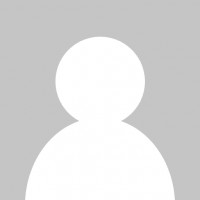 7 What 3D mobile phones are available in the UK? 8 Is it a revolution or a big gimmick? How does the human eye perceive 3D? Like many other animals, humans have two eyes so that we can see in 3D. As each of our eye are in slightly different places, each eye will observe objects from a slightly different angle. The brain will then piece together the information received from each eye to calculate the distance to the object (hence giving depth perception). How do 3D mobile phones generate a 3D image? Clearly, a mobile phone with a flat screen is unable to generate a real 3D image with actual depth. For this reason, all 3D viewing technologies need to “trick” the brain and fool it into believing an image is actually in 3D. 3D displays achieve this by sending a slightly different image to each eye so that the brain computes the required depth when the images are combined. Red/Blue Glasses: Two separate images are displayed on the screen – one red image and one blue image. The two images are superimposed onto each other. Each lens is designed so that only one image can pass through it (e.g. the red lens only allows the red image through). This means each eye will only observe one of the images. Polarised Glasses: Many cinemas currently use polarisation technology for 3D movies. Similar to before, two different images are projected on the screen but this time each image has a different polarisation. The glasses are then designed so that each eye will only see one of the polarised images. 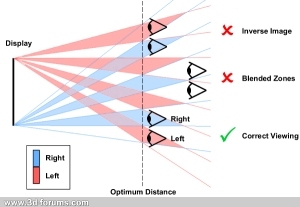 Auto-stereoscopic: Instead of requiring the viewer to wear special glasses, screens can be designed so that each eye will see a different image without glasses (see diagram on right). A “parallax barrier” (illustrated) is used to ensure a different image reaches each eye. The disadvantage of auto-stereoscopic technology is that the viewer must observe the screen from the correct angle for it to work – fine for a viewing content on a portable mobile phone but not so good for a television set if you want to be able to move around the room. See the diagram below for an illustration of what happens when an auto-stereoscopic display is viewed at the wrong angle. 3D mobile phones use auto-stereoscopic technology. 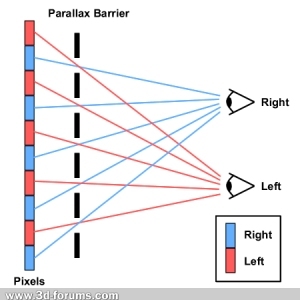 The “parallax barrier” is created using liquid crystals and can be toggled on and off to switch between 2D viewing and 3D viewing. Are glasses required to use a 3D phone? No. 3D mobile phones use auto-stereoscopic technology. The “parallax barrier” in front of the screen ensures a different image is sent to each eye so glasses are not required. Auto-stereoscopic displays work pretty well: you get a full colour image and pretty decent 3D depth of field. The downsides are that you’ll lose out on some of the image resolution and colour vibrancy of a 2D screen and for the 3D to work, you’ll need to make sure you’re viewing the screen from the right place. Some people also complain of eye strain and headaches from prolonged viewing of auto-stereoscopic displays. Thankfully, today’s 3D mobile phones can be toggled between 2D and 3D modes so the 2D mode can be used when 3D is not required. 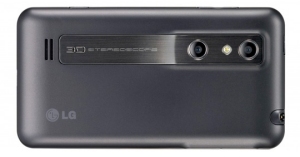 The LG Optimus 3D and HTC EVO 3D both use auto-stereoscopic technology and can be used either in 2D or 3D viewing mode. The Nintendo 3DS portable gaming device also uses auto-stereoscopic technology. How much 3D content is out there? Unfortunately, there isn’t yet a huge lot of 3D content out there to consume on a 3D mobile phone. For online video, YouTube have a 3D service and a YouTube channel where they showcase some 3D content. This 3D content can also be viewed on laptops and standard mobile phones using red/blue glasses. One of the problems being an early adopter of technology such as 3D is that it’s unclear whether it’ll really take off. Until it does, nobody wants to create any content in 3D. And until 3D content exists, the mass market isn’t going to buy a 3D mobile phone. Broadcasters such as Sky are now recording some of their content in 3D for their broadcast television service but it could be a while before that content is available on the mobile phone format. 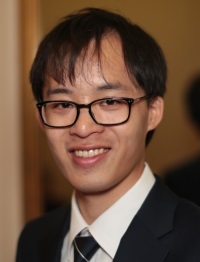 How do 3D mobile phones capture pictures and video in 3D? 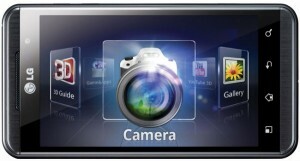 Phones such as the LG Optimus 3D have two cameras. They capture images from two slightly different angles (in the same way the eye does) to form a 3D image. 3D mobile phones contain two cameras. This means that in 3D recording mode, images can be captured through both cameras from two slightly different angles. Using the same principle that the eye uses, depth of field can be calculated and hence a 3D image can be captured. Note that if you’ve produced any 3D content with your phone, it’s possible to upload the video recordings directly to YouTube. To ensure it displays properly, make sure you add the relevant tag when you upload your video. What 3D mobile phones are available in the UK? So far, the LG Optimus 3D and HTC EVO 3D are the only two 3D handsets which have been announced for a UK launch. Both phones are fairly well matched in terms of specifications: they both run Android and feature a 4.3-inch auto-stereoscopic 3D touchscreen display. Both phones feature dual-core processors and have two 5-megapixel cameras on the back for 3D photography and 3D video recording. Is it a revolution or a big gimmick? My personal opinion? I reckon 3D is a bit of a gimmick and a fad. I was lucky enough to have the chance to play with the LG Optimus 3D at Mobile World Congress in February. Sure, people were queuing up to try this handset: it was something totally new and different from what was on the market. And the 3D depth-of-field and image quality was pretty good too. But I just couldn’t figure out how 3D improves my life at all. 3D doesn’t make it any easier for me to stay in touch with my friends: a phone with 3D doesn’t enhance the process of make a phone call, sending a text message or browsing the internet. Nor did I feel there was enough compelling 3D content to opt for a 3D phone: the best games such as Angry Birds and Cut the Rope are all in 2D. Perhaps 3D is going to be the future, but at the moment it feels like a huge gimmick. There are always huge risks being an early adopter in any field – and I don’t think 3D is compelling enough a proposition for those risks to be worthwhile. For the time being, I’d stick with the trusty 2D smartphone. All companies are always looking for something new to sell. Okay for those who want to brag, but I do not think that is a real need in mobile devices today.